Poached chicken, carrot, coriander, fresh mint, cabbage, crushed nuts, shallots, seeds, capsicum and a lightly spiced Asian dressing. 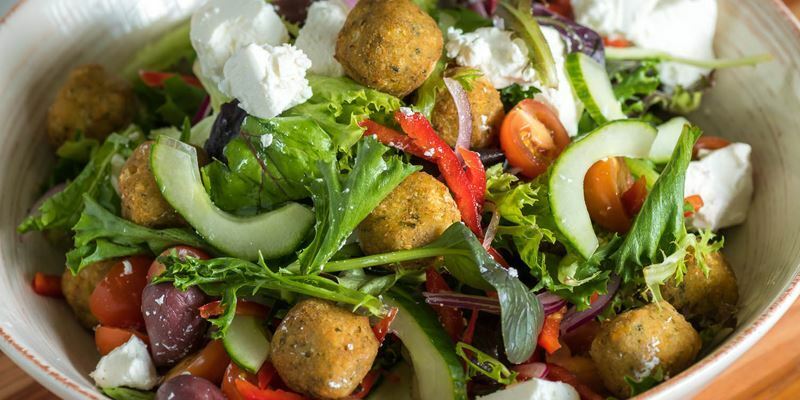 Mixed greens, tomato, cucumber, red onion, roasted pepper, olives, feta falafel and yoghurt dressing. Tuscan chicken, mixed greens, tomato, cucumber, red onion, roasted pepper, olives, feta falafel and yoghurt dressing. Broccolini, semi-dried tomatoes, roasted pumpkin, Quinoa, baby rocket, red onion, chickpeas and feta. Penne pasta with sun-dried tomato vinaigrette dressing, olives, fresh basil, shaved parmesan and spinach. Bacon, penne pasta with sun-dried tomato vinaigrette dressing, olives, fresh basil, shaved parmesan and spinach.